Product information "Medallion Printed Silk / Cotton Grenadine Tie - Olive"
The light weave of our silk / cotton grenadine ties makes it possible to offer ties that are delicate yet have great hold. Wear this tie with a sky blue button down cotton shirt, navy boxcloth braces and navy animal pocket square. You will no doubt receive a sartorial salute from those who recognise elegance in dress. In the heart of the Italian silk industry, Como, lies one of the oldest silk weavers in Europe. Founded in mid-19th-century, at first as a supplier of silk for furnishings and clothing, they began to make silk for ties when it took its modern shape at the beginning of the 20th century. To this day, a lot of historic, wooden looms are in use, which have not been produced in decades. But there is no substitute for them: our popular grenadine silk is woven on them, for example. We just love this heritage of Italian craftsmanship and we do our best to keep those traditions alive. 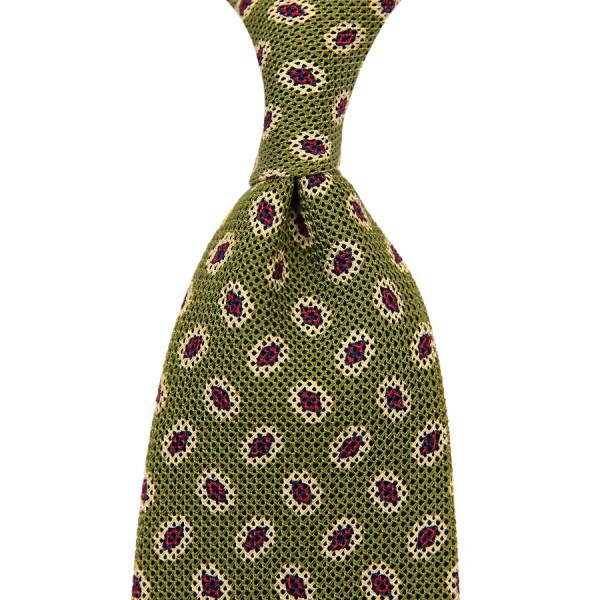 Related links to "Medallion Printed Silk / Cotton Grenadine Tie - Olive"